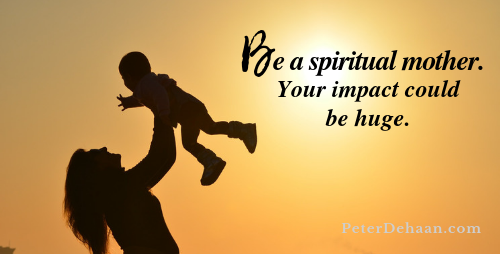 HomeBlogThe BibleCan You Be a Spiritual Mother to Someone? Paul wraps up his letter to the church in Rome with a long list of people Most of these names stream past our eyes as unfamiliar. We’re tempted to skim. But slow down. Consider Rufus (Romans 16:13). That name only appears in one other place in the Bible, and that likely refers to a different guy. So we know little about this Rufus except that Paul greets him by name. Paul shares no reason, offers no encouragement, and gives no backstory—other than to say Rufus is chosen by God. Oh, and there’s Rufus’s mother. Paul doesn’t even give her name, just her role as Rufus’s mom—who has also been like a mom to Paul. This is huge. Rufus’s mom has a biological son, Rufus. She also has a spiritual son, Paul. When you think of mothers, what traits come to mind? I think first of loving. Following that comes nurturing, encouraging, and supportive. Mothers also hope for the best from their children and always believe in them. And most mothers like to feed their kids, too. Some women have biological children and others do not, either by choice or by circumstance. The ladies in this last category long to have kids but do not. The Bible is replete with longsuffering women who pray earnestly and ache to have children. After decades of waiting, God gives them what their heart desires. Yet whether a biological mom or not, we can all be spiritual mothers. And this includes guys, too. Who needs love, nurturing, encouragement, and support? Although the answer is everyone, I’m sure some specific individuals come to mind. Be a spiritual mother to them. You never know the impact they might grow up to have on others. Thanks for that one. It touched my heart.